In the U.S, over 700,000 people suffer from a stroke each year, with approximately two thirds of these individuals requiring rehabilitation to regain a degree of functioning. Early rehabilitation after a stroke has shown to substantially improve long term outcomes. Our Physical Therapists encourage the use of impaired limbs with various supervised goal oriented exercises to not only encourage muscle strengthening and rebuilding but to also promote brain plasticity and neurological healing. 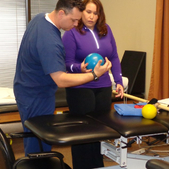 How Can Stroke/CVA Rehabilitation Help You? Positioning to reduce spasms, muscle pain, slowness and stiffness.